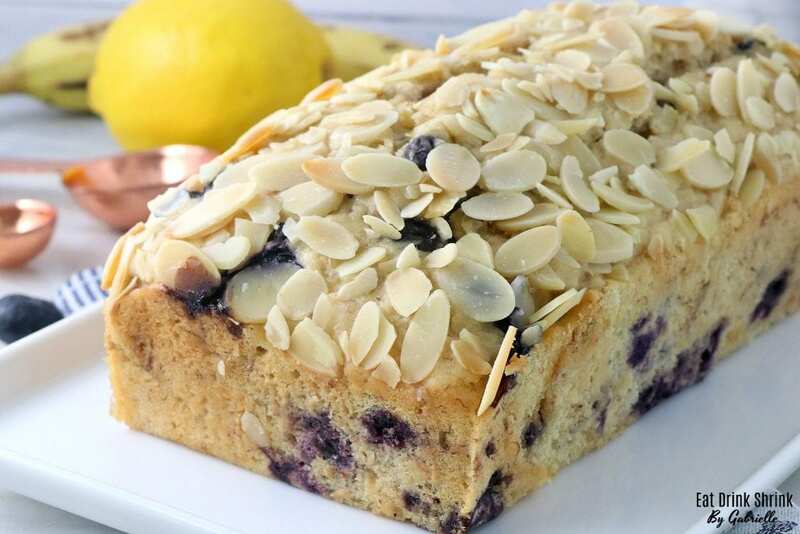 Vegan Lemon Blueberry Cake - Eat. Drink. Shrink. I must be tired, because in all honesty I had to check my calendar to confirm the day of the week today lol. If you’re swamped with life right now, then quick and easy concept will be your saving grace! Within the past few years I’ve gravitated away from smoothies, but even having said that, I always have fresh bananas on hand to throw into recipes. They seamlessly add moisture and can even serve as an egg replacer in recipes at times. 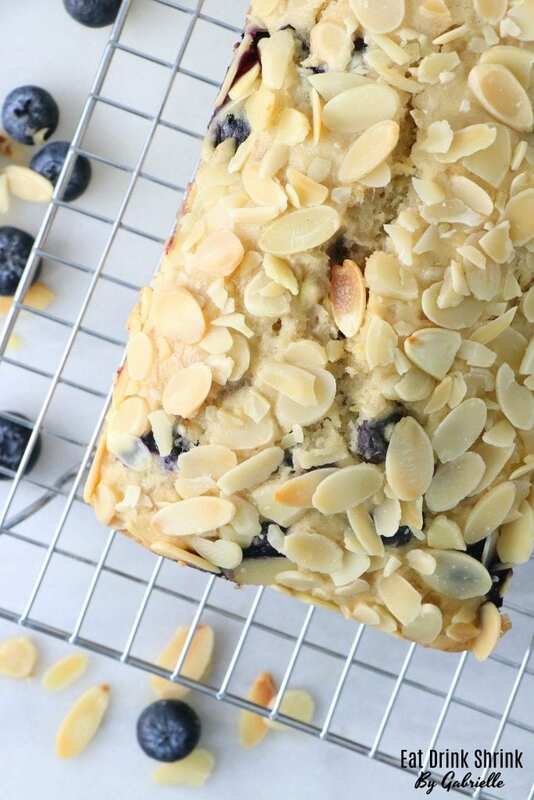 What’s funny is, I never use fresh bananas as they always go bad, but make for the perfect banana bread concept or natural sweetener to recipes. The longer they sit and ripen, the more natural sugar content they have. Since I cook full time, I try to reduce the added sugar content in every recipe and bulk up the fruit. At least with fruit you’re obtaining beneficial properties rather than processed sugar that’s just, sugar. If you know anything about my preferences, I love all things fruit forward versus chocolate, and all things lemon and lime. 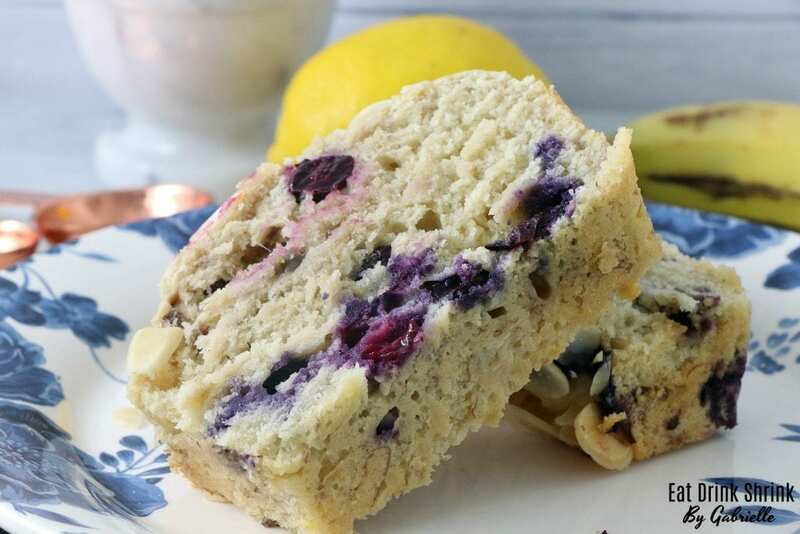 With a handful of blueberries on the verge of spoiling and bananas that were way overdue, this recipe for Lemon Blueberry Cake was a no brainer! What I love about this recipe, is everything! 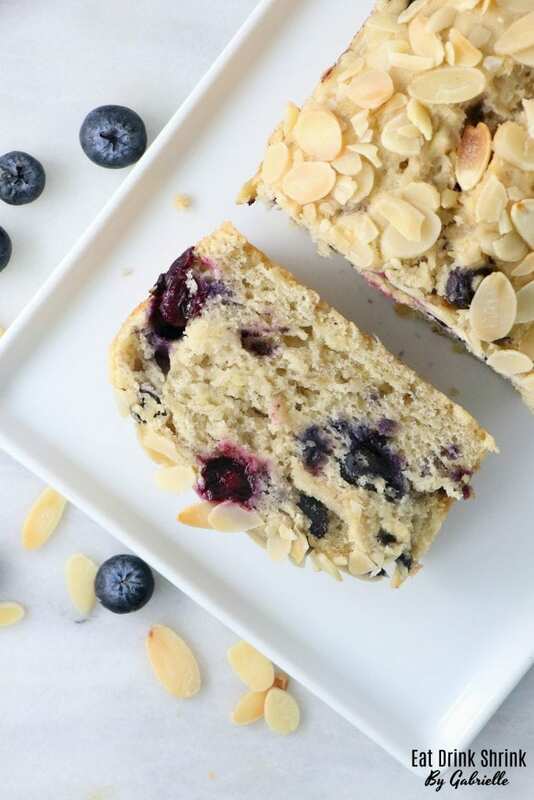 It involves a handful of ingredients, affordable, minimal sugar, packs fruit, notes of lemon, is buttery soft, has a cake like texture, aesthetic appeal, perfect or any season and can be topped with icing if you want more sweetness! 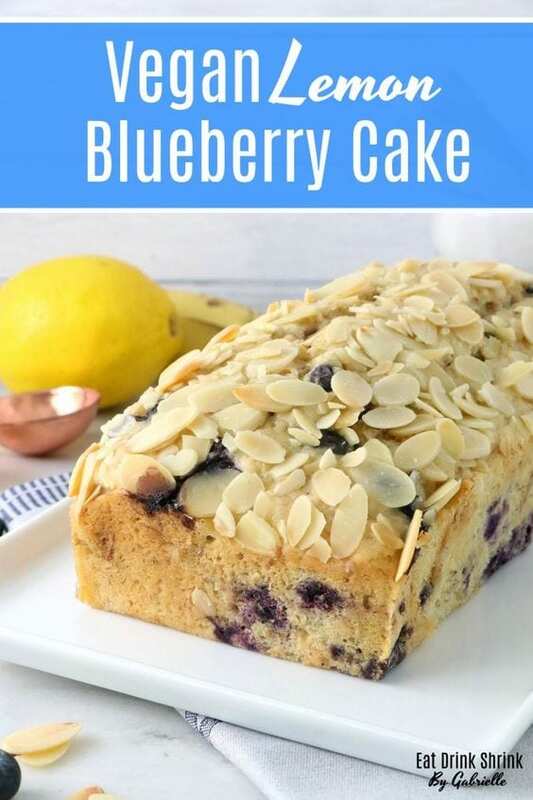 If you love staple recipes that don’t disappoint, you have to try this classic recipe for vegan Lemon Blueberry Cake!! 3/4 cup almond milk combined w/1 tsp lemon juice "vegan buttermilk"
Preheat the oven to 350 degrees F. Grease well the bottom and sides of a 9x5" loaf pan. In a medium bowl, whisk together flour, baking powder, lemons zest, and salt. You can throw the zest in the wet, but I find that it flavors the flour and creates additional flavor. In a large bowl combine the mashed bananas, almond milk (room temp) with lemon juice "vegan buttermilk", coconut sugar, lemon juice, vanilla, and melted coconut oil. If the oil begins to solidify due to the cold almond milk, simply pop in the microwave for a minute. Slowly fold the dry ingredients into the wet, just until incorporated. (optional: In a separate bowl mix the blueberries with 1 Tbsp of flour) and then gently fold them into the mixed batter. Pour the batter into the pan and top with slivered almonds. Bake for 55 minutes - 1 hour or until a toothpick inserted in the center comes out clean. Remove from oven and allow to cool in the pan for 10 minutes. Transfer to a wire rack to cool completely. 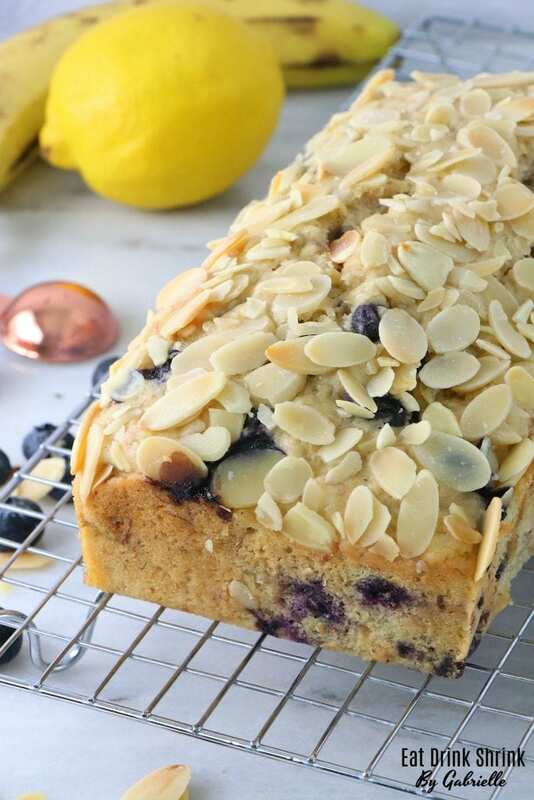 For the glaze (Optional): Whisk together the powdered sugar and lemon juice and drizzle over the top of the loaf. Allow to set/harden before serving. Looks delish! Do you mean "get away with 1/3 cup"? Hi Caroline, yes! Thanks for catching that! If you would like to do low sugar you can opt for 1/3 cup! I tried this recipe last night and all I can say is WOW. It’s hard to find recipes that feel indulgent yet are still made with good, healthier ingredients, but this one ticked off all the boxes! I even had my family try it without telling them I made it or that it was vegan and they all loved it! Thank you for helping me prove to them that vegan food can be delicious too, and keep up the good work! Hi Jennie! Amazing, thanks for sharing! If you get to share via social media tag Eat Drink Shrink and I'll share with everyone on IG Stories! Hey Jen! I would say that 1 1/2 bananas came out to about 3/4 cup. If the mixture seems too wet, more so than the video tutorial I would add more flour. 1tbsp at a time! Thanks! Can’t wait to make this for my weekend treat. Hello, do you happen to know the nutrition facts! Hi Eileen, nutrition facts are never provided as they can be inaccurate. You're welcome to enter the ingredients into a program to evaluate the caloric content. Can fractionated coconut oil be used so that it doesn't matter if cold almond milk is used?